If you’ve never heard of the word before, Pintxos is a type of food. Specifically, they’re those small finger foods that are served at taverns and bars within the Basque Country. These foods are essentially Basque and are a very important part of Basque food culture. Often mistaken for tapas (because of their sheer similarity), pintxos are distinctively smaller. The word originated from “pinchar,” which means to “stab” or “poke” in Spanish. As far as history goes, the pintxos were originally served on small bread slices and skewered with a toothpick right in the middle. But like most food cultures, Basque cuisine has reinvented the pintxos until it became the diverse set of appetizers they are known as today. Of course, you can still find them pierced on small pieces of bread sometimes. Which is which? Either is fine, actually. Sometimes you will see the word “pintxos” on the menu while others will use “pinchos” and both are valid uses of the term. However, the Basque Country commonly uses “pintxo” as their preferred variation of the word since it is technically the correct way to use it based on the Basque language, but subject to the fact that they recognize the Spanish spelling “pincho” acceptable as well. Either way, this shouldn’t affect your dining experience, so don’t make too much of a fuss about it. Up for a Txikiteo? The words means “pintxo crawl.” If you ever visit a tavern or bar in the Basque Country, it is normal for you to find a whole counter filled with all kinds of pintxos all lined up in plates. This is done for traditional potato and onion omelete (tortilla de patatas) as well as the grilled foie gras and other mini haute delicacies. As such, the pintxos that are up for grabs are usually the ones that are on display. 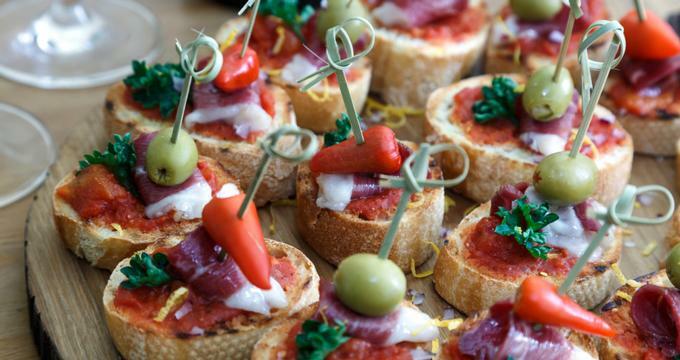 These are popularly referred to as “cold pintxos”, although you can request to have them warmed up before being served. Some bars, however, will serve a host of other pintxos on top of the ones that are on display. These off the counter pintxos are aptly called “warm pintxos” since they are cooked as they are ordered. They tend to be more expensive though, but have proven themselves to be a lot tastier than their cold counterparts. With all the pintxos displayed at the counter in one bar before you, it’s hard not to sample every single one. But if you want to make the most of your pintxo hopping experience, you’re going to want to learn the art of controlling yourself and waiting for other opportunities, which there are a lot of in the Basque Country. If you’re at one pintxo bar, you can bet that there’s another one just around the corner with their own pintxos as well, so make sure you don’t spend all your money in one place. This is called a pintxo crawl, which is similar to a bar crawl, except for these delicious little Basque appetizers. As a matter of fact, the pintxo crawl is an activity most people in Basque take quite seriously, and by seriously, we mean competitively. The local pintxo bars and taverns compete with one another for trophies that are won annually. They compete with who has the best pintxos in the locality in the hopes of not only winning the awards but also the public who love them so much. One of the most prestigious pintxo competitions includes the Euskal Herria Pintxo Contest, which takes place in Hondarribia every October since the year 2006. Depending on where you are, eating pintxos can come in different ways. Some bars, especially the ones in San Sebastian, have a self-service policy, where people bring their own plate to a counter where they get the pintxos they want. They are then charged accordingly at the end of the line. In other locations, pintxos are served on a per order basis together with a drink, which will be served by the waiter. How do you tell which is which? Simply ask the waiter for pintxos. If, instead of taking your order, he hands you a plate, it means you get to help yourself with the appetizers. One interesting fact about the pintxos culture is that they are not considered full meals. These are often treated as an appetizer or a snack before getting started with lunch or dinner. Of course, you’re perfectly welcome to have as many as you want. The easy answer to this is Basque Country. They’re very popular there, especially on the Spanish side of the region. There are, however, certain locations like the old towns of San Sebastian as well as Hondarribia marina district. While the difference between pinchos and pintxos are simply linguistic, the distinction between Basque’s famous appetizer and tapas is a bit more complicated. In fact, much of it is largely context specific to certain parts of Spain. One very common misconception, especially among some Spaniards who don’t get around the country much, thinks that tapas are served for free wihle pintxos are not. This, of course, is false. If you got to the Basque Country, you can go to a bar and they will serve you pintxos. Few will call them pinchos, but no one will ever refer to them as tapas. This is regardless of whether the pintxos is the traditional kind or otherwise. It can be on a piece of bread or served with a drink, but it’s still called a pintxo. And with each order, you have to pay for them. But if you go to Salamanca, you’re likely to find pinchos and will almost always look like a piece of meat served on bread. It doesn’t always have to be on a stick, but it’s their version of a pintxo there. In most cases, they are served for free to customers. If you go to Granada, Leon, and nearby cities, including some places in Madrid, you will find appetizers, some of which are served on bread. These are the ones people know are tapas. And yes, they are for free. However, some places like Seville serve tapas but they are not for free. In other places, still, they even serve large portions of appetizers and they are still called tapas. Still confused? Don’t worry too much about it. If you’re not sure what to call them, just look at the bar’s menu and you’ll know immediately if they prefer to call them pintxos or tapas. What’s important is that they’re good and, if you haven’t yet, you should try them.